Buy it here (scroll down) or GET IT FREE with the Lovely Edition of On Walking. In this photo-essay Phil, an ambulant academic at Plymouth University, UK, urges us to undertake an ‘experimental pilgrimage without destinations’ where disfigured pedestrian figures are just a small sample of the absurd, ironic and accidental artworks in the urban landscape that, if we take the trouble to notice them, will rearrange our attitude to the world. In this lovely photo-essay, Phil Smith - playwright, walk-performance artist (Wrights & Sites and Crabman) and author (Mis-Guides, Mythogeography, On Walking and Counter-Tourism) draws our attention to a “chorus of surprises” “yelling from the sides of the road like particularly unruly spectators at a parade”. Focusing on signs, simulacra, objects and places that prove to be more, less or other than what they seem (all illustrated throughout the book) the author encourages us to look afresh at our quotidian urban and rural surroundings to see what lies just beneath the surface. Once identified, these absurd, empty, recalcitrant enchantments can transform the way we live and think and occupy our inner and outer landscapes. Urging us to “hypersensitize ourselves to the full blast of contemporary landscape’s intensity”, Phil Smith explains how to “let our tentacles unfurl” in order to explore and see the world around us in all its glory. "I stop for a moment. I look about me. Something slightly ‘off’ catches my eye: an incomplete sign that teeters toward the absurd, a rusted doorway that triggers a rare feeling of conviction, a tree shaped like a pinball machine, the remains of a windscreen glittering like emeralds, a fence just a little too bright for a barrier, a toy bigger than it ought to be. Such combinations of things and feelings have been the objects of my explorations and collections for some time now. In my experience, the more ordinary the place the more likely it is that discordance and its accompanying ‘fanged noumena’ will pop up; and the more deeply will the anxieties that falteringly accompany them burrow." 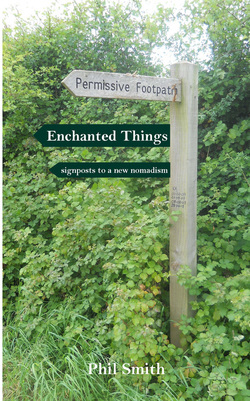 Enchanted Things is a photo essay for anyone with an enquiring mind and an interest in exploring the ways in which they move through the world.